Do you love the look of rockstars like Ozzy and Lemmy whose heavy metal was accompanied by a fistfull of… heavy metal? Gothic jewellery looks great wherever you are and whatever you’re wearing. The Great Frog is perhaps the biggest name that comes to mind when you think of skulls cast in high quality sterling silver. Unfortunately with average prices pushing £150+ these incredible pieces are prohibitively expensive – especially when you want to fill a fist like a real biker. Then there’s the next most recognised brand Crazy Pig of Covent Garden that sells absolutely breathtaking designs but for an even steeper premium. Jewellery is a luxury that can be hard to justify. 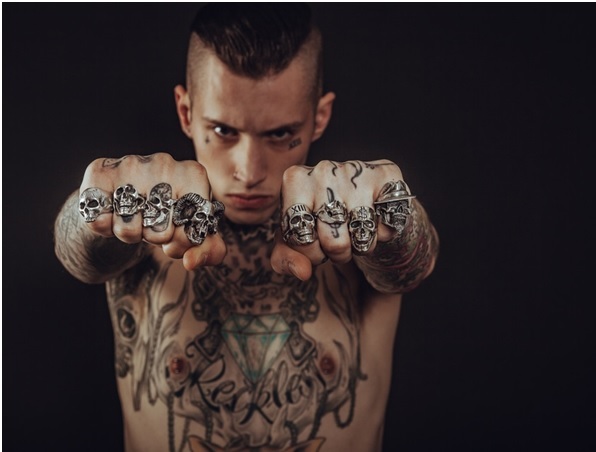 Some of these huge skull rings and pendants can be a bit much for everyday wear and so as beautiful as they are they may not represent a good investment even if you do save up to treat yourself. But those gleaming cabinets can be more accessible than you think with the right method. It’s also important to remember that jewellery keeps a high capital value that can be liquidated if you regret your purchase or simply want to move on and raise some cash years down the line. The problem is the initial retail markups can be huge so the moment you make a purchase – unless its a rare collaboration – you are very unlikely to make back anything close to what you paid. Overall bringing down the bottom line is key – and we don’t mean haggling. For a start, try looking into other brands. Etsy has some great small-scale makers who can be a lot cheaper without the premium branding, plus you know your money is supporting one artisan who probably isn’t backed by celebrity clientele. But if you still want the original and the best then there’s good news for you. Plenty of past buyers want to move on from their rock’n roll jewellery and so you can snap up some real bargains on Ebay if you know how. Have a look at some of the amazing designs from The Great Frog and Crazy Pig right now through these links. 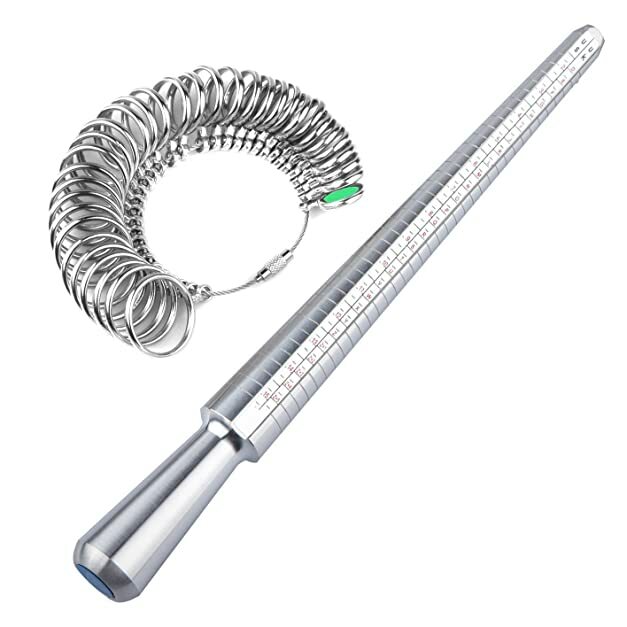 Next, get yourself a ring sizer. These can be found very cheaply and while investing in both a ring-sizer mandril and ring-sizer keys for your first purchase may seem excessive it can save you a whole lot of trouble in the long run. Ring sizers make it easy to find out what secondhand jewellery will fit you when you don’t have the luxury of buying your size upfront in a shop. If you already have a ring that fits you and you want to buy another the same size then slide it onto the mandrill and it will tell you your size. Most designs like this one show the size in various international formats which can be a great help. If you don’t have a ring or want a ring for a different finger then you need a set of ring-sizer keys. These loops slide onto your finger so you can find which one fits right and read what size it is. Make sure you can comfortably get the ring-size on and off so you don’t risk cutting off your circulation when the ring you order to that size arrives. Also remember that biker rings tend to be big and heavy and so while you don’t want a ring that’s too tight you still need a good fit. Now have a look at these secondhand offerings and see what could fit you already. This is an easy way to grab bargain jewellery since most people don’t know their ring size and have to factor in an additional cost of resizing. If a design you really like isn’t in your size then you can normally have it resized by a good jeweller for around £10-£20 while Crazy Pig or The Great Frog will also resize for you providing that your design was made by them. Collecting jewellery like this is addictive and sooner or later it’s very likely you will grow quite a collection – often with some fingers ringless and others with a choice of several rings made to their size. As with any collection you can choose to downsize and then upgrade by selling a few pieces and buying one extra special object with the proceeds. Look at the extreme high-end of rock n roll jewellery that pushes the boundary of taste with brands like Chrome Hearts and King Baby. Etsy also holds a few hauntingly good makers like Book of Alchemy and BroncoManor that are both costly but offer incredible anatomical pieces.